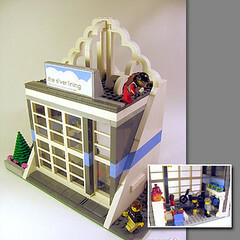 Brick Town Talk: The Silver Lining and More by Morgan190 - LEGO Town, Architecture, Building Tips, Inspiration Ideas, and more! This builder's been stockpiling good creations and just posted a bunch at once. 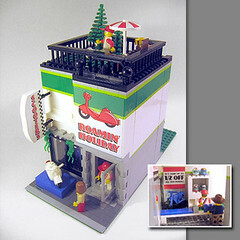 There is a whole "flickr collection" of town MOCs. I've gone ahead and posted one photo of each so far on the blog here, and made each photo a link to the flickr set - just click the pictures here to go to more photos of each building. 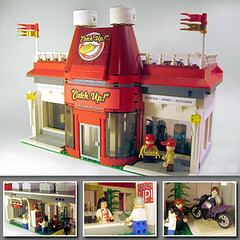 Jamie's buildings are fantastically creative and hilarious at the same time! There should be a lot more traffic on his photostream.